Not world famous, but one of Norway's most popular actors/comediennes was born in Teheran in 1978 as Forozan Sagogi Nazer. She was one of the last adoptive children from Iran given to non-muslim adoptive parents. She's as Norwegian as anyone as far as I'm concerned, and her name is Lisa TÃ¸nne. News.com: The responsibility for protecting Windows systems against ever-increasing threats is in new hands. 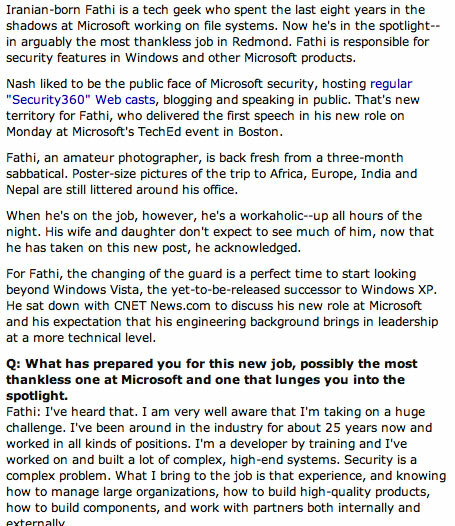 Ben Fathi, a software engineer by trade, took over from Mike Nash as corporate vice president of Microsoft's Security Technology Unit on June 1. Nash is on sabbatical.